The TPS6420x controller is designed to operate from one to three series-connected cells or from a 3.3 V or 5 V supply obtained from a USB port. 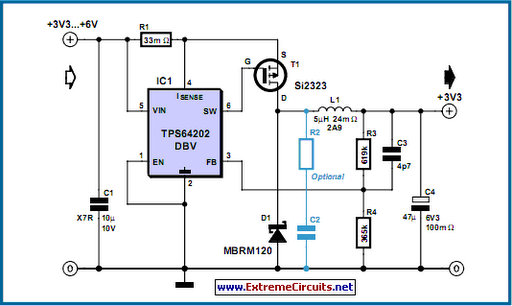 At its output it can produce 3.3 V at 2 A, suitable for powering a microcontroller-based system. With a suitable choice of external components (inductor, P-channel MOSFET and Schottky diode) the device can be operated over a wide range of possible output voltages and currents. A further advantage is its extremely low quiescent current consumption in power-down mode (100 nA typical) and in no-load operation (20 mA). Also, if the input voltage is less than or equal to the desired output voltage, the device can connect the output directly to the input. Using just a few external components the TPS6420x can cover an output voltage range from 1.2 V up to the input voltage at up to 3 A, as long as a suitable P-channel MOSFET and Schottky diode are used. The device is an asynchronous step-down converter which, unlike the more widely-used PFM (pulse-frequency modulation) and PWM (pulse width modulation) types, involves a constant on-time and/or constant off-time. Conventional controllers operate in PWM mode at medium to high loads, switching to PFM at lower loads in order to minimise switching losses. The controller described here also adjusts its switching frequency in accordance with the load to achieve a similar effect to the PFM/PWM controllers. The circuit diagram shows a classical step-down converter with an input voltage range from 3.3 V to 6 V and an output voltage of 3.3 V at a current of up to 2 A. The optional 33 m shunt resistor provides for current limiting. 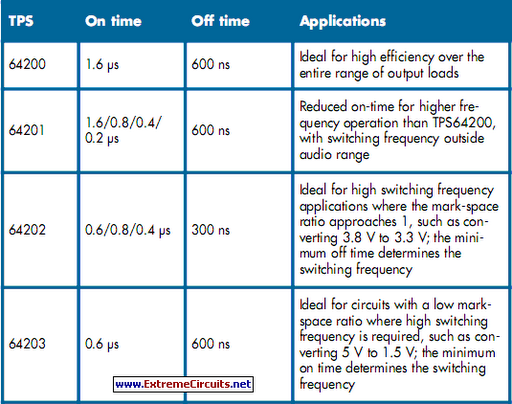 The TPS64202 offers a minimum on-time selectable between 1.6 ms, 0.8 ms, 0.4 ms and 0.2 ms and a fixed off-time of 300 ns. A MOSFET in the supply voltage path is switched on by the controller for as long as is necessary for the output voltage to reach its nominal value, or until the maximum permissible current, as determined by the shunt resistor, is reached. If the current does exceed this limit the MOSFET is switched off for 300 ns. If the nominal output voltage is reached, the MOSFET is switched off and remains in the off state until the output voltage once again falls below the nominal value. At very low output currents the controller therefore operates in ‘discontinuous mode’ (DCM). Each switching cycle begins with the current at zero. It rises to the threshold or maximum value, and then falls again back to zero. At the moment of switch-off the Schottky diode causes the residual energy in the inductor to appear as a quickly-decaying oscillation at the resonant frequency of the output filter. This low-energy oscillation in discontinuous mode is normal and has no adverse effect on the efficiency of the converter. It can be damped using the (optional) RC series network. At higher output currents the switch-down converter operates in continuous conduction mode (CCM). In this mode the inductor current never falls to zero. The output voltage is directly proportional to the switching mark-space ratio in this mode. If the Si2323 P-channel MOSFET from Vishay-Siliconix is not available, the IRLML6401 (12 V type) or IRLML6402 (20 V type) from IRF can be used instead. Both these types have a higher on resistance, but do offer a lower gate capacitance. An alternative for the Schottky diode suggested is the MBRM140 (available from Digi-Key and Farnell), although this is in an SMB package rather than the Powermite package of the MBRM120. The voltage drop at 1 A is somewhat higher: 0.6 V instead of 0.45 V. The devices are manufactured by IRF and ON Semiconductor.